At U.N. Myanmar Leader Praises Suu Kyi, Highlights Changes : The Two-Way Myanmar President Thein Sein mentioned activist Aung San Suu Kyi during his speech at the U.N., believed to be the first time a Myanmar leader has done so. He laid out the country's democratic transformation so far, and addressed the sensitive subject of ethnic unrest in the Southeast Asian nation. Myanmar President Thein Sein made his debut at the U.N. General Assembly today, using his speech (posted here) to enumerate the democratic reforms implemented so far during his 18 months in office. Thein Sein also used his time at the podium to acknowledge and to congratulate Nobel Laureate and democracy activist Aung San Suu Kyi on honors she has recently received in the United States, including the Congressional Gold Medal. According to The Associated Press, Thein Sein's U.N. address marks the first time a leader of Myanmar has mentioned Suu Kyi at a world body. It also noted that the event was broadcast live in Myanmar, which it said was also unprecedented. The lifting of the trade restriction is the latest in a series of steps by the U.S. to ease sanctions on the country that is emerging from decades of authoritarian rule. 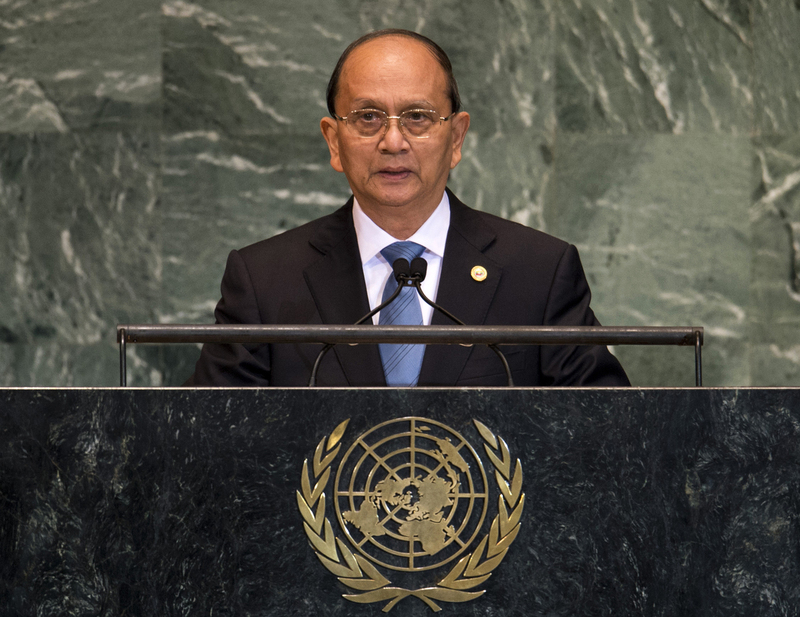 That theme of transformation dominated Thein Sein's U.N. speech. The people and institutions of Myanmar "have been taking tangible irreversible steps in the democratic transition and reform process," he said. "The political progress in our country is enhancing its political legitimacy," he said. "This, in turn facilitates the creation of basic political stability thereby paving the way for economic and social transformation necessary for better living standard of the people." Thein Sein also addressed continued ethnic unrest in western Rakhine state, where at least 78 people were killed this summer in clashes between minority Muslim Rohingya and majority Buddhists. He noted that a national commission — including Buddhist, Muslim, Christian and Hindu members — would be investigating and reporting their findings directly to him. Myanmar has been undergoing dramatic change under Thein Sein's leadership — from the release of political prisoners to the loosening of restrictions on the media and political participation. And the treatment of Suu Kyi is perhaps the starkest example of the change. Still, the international community remains wary and watchful, as it's unclear how far Thein Sein is willing, and able, to go in implementing more democratic changes.